India’s Regional Navigation Satellite System is set for completion on Thursday when the seventh navigation satellite will take flight on a Polar Satellite Launch Vehicle. 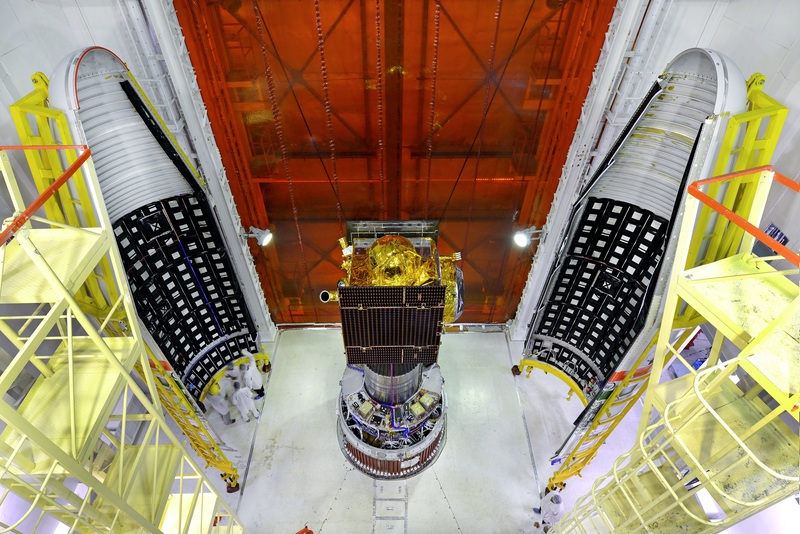 Set to join the constellation of Geostationary and Geosynchronous satellites, IRNSS-1G will bring the system to full capacity to mark the conclusion of a nearly three-year deployment phase. Booked for the easternmost spot in the satellite constellation, IRNSS-1G will expand navigation services to the system’s full capacity when becoming operational several weeks after Thursday’s launch. 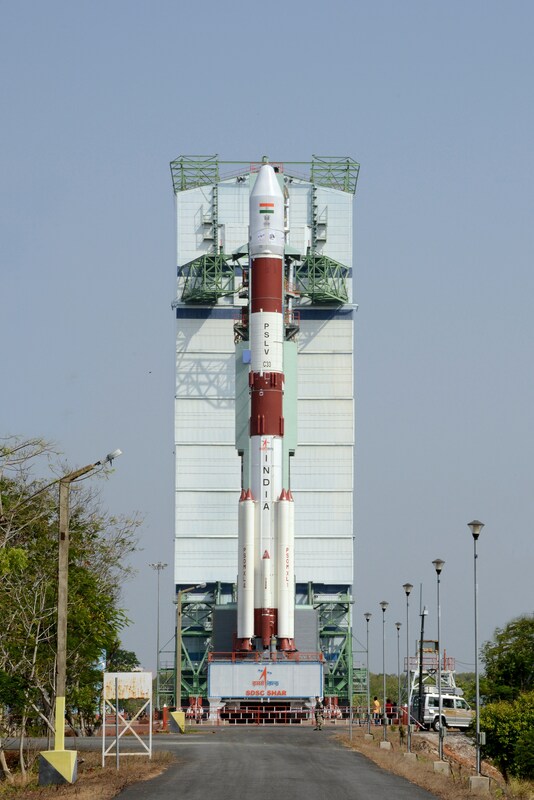 Liftoff from the Satish Dhawan Space Center is set for 7:20 UTC and the four-stage PSLV rocket – flying in its most powerful XL configuration – will complete a 20-minute ascent mission to drop IRNSS-1G off in a sub-GTO type orbit from where the 1,425-Kilogram satellite will make its way to GEO join the six IRNSS satellites that are already delivering services. Having entered initial services earlier this year, the Indian Regional Navigation Satellite System has been designed to provide India with independent access to accurate navigation data, ending the country’s reliance on foreign programs. Unlike other navigation systems such as the American GPS, Russia’s Glonass, Europe’s Galileo and the Chinese Beidou constellation, IRNSS has been designed from the start to only deliver regional services – covering the Indian territory and an area about 1,500 Kilometers beyond its borders. A regional system operated from Geosynchronous Orbit is not as complex as a global architecture requiring over two dozen satellites flying in a perfect orbital formation – associated with considerable deployment and maintenance cost. 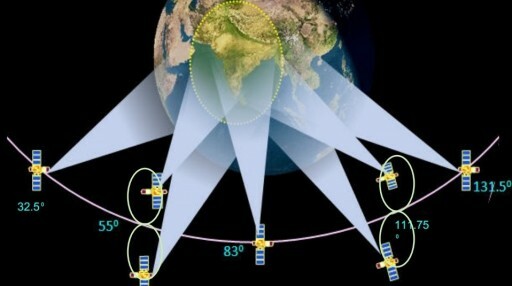 The first generation of IRNSS is comprised of seven satellites – four in inclined Geosynchronous Orbit and three in Geostationary Orbit over the equator and constantly visible from India. IRNSS has come a long way since being approved as a project in 2006. 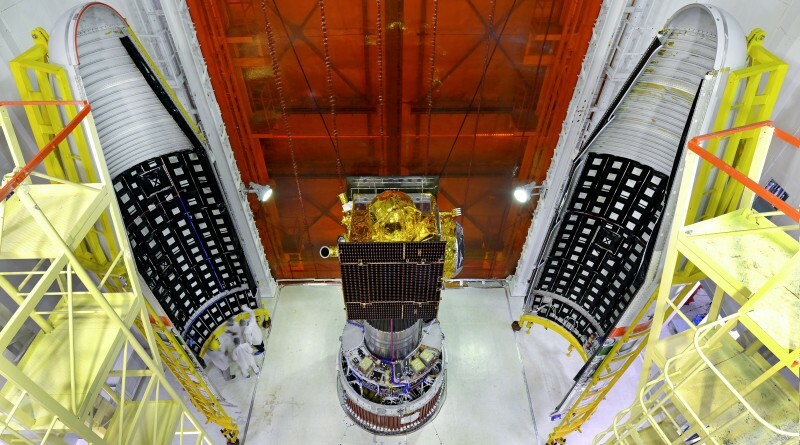 Deployment first started with the launch of IRNSS-1A in July 2013 and the pace of launches was accelerated after the first satellite proved its functionality in orbit with the last three satellites heading into orbit in the first four months of 2016 to finish the constellation. IRNSS is compatible with the U.S. Global Positioning System and Europe’s Galileo constellation using navigation signals in S-Band and the L5 Band. The heart of each satellite is a highly precise Rubidium atomic clock used to generate navigation signals delivered as part of a Standard Positioning Service that is open to all users as well as a Restrictive Service with high accuracy only provided to authorized users. 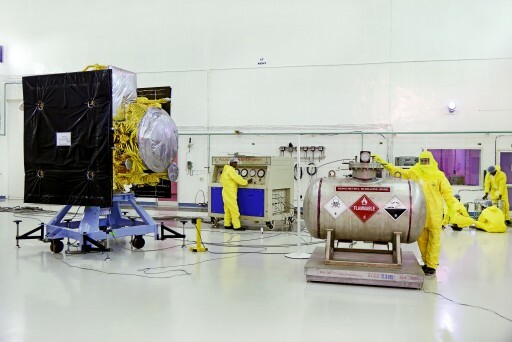 Built for an operational life of 12 years, the first generation of IRNSS satellites is expected to be able to deliver services for the next decade. IRNSS-1G, destined for the 131.5° East slot in the constellation, finished testing in February and reached the launch site in mid April for final processing before taking its spot atop the four-stage PSLV rocket which completed assembly over the past weeks. This mission uses the First Launch Pad at Sriharikota that last saw action in December with the launch of PSLV C29 carrying six satellites from Singapore. 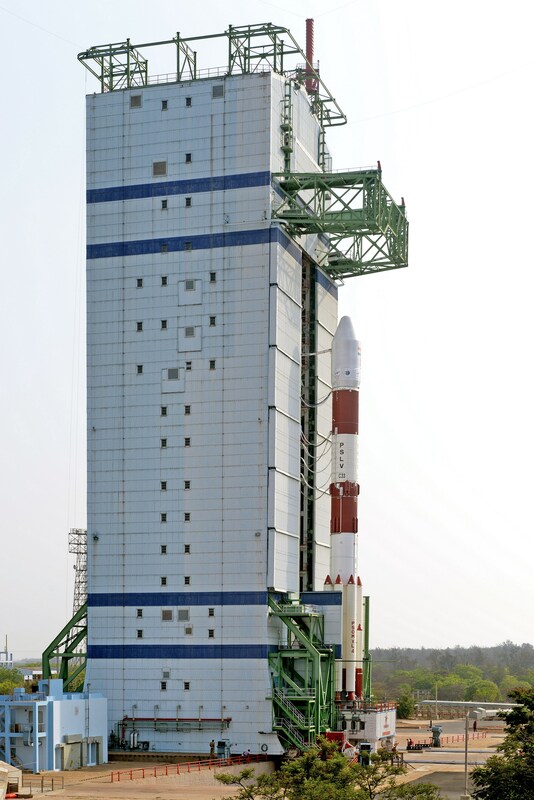 The Mission Readiness Review was performed on Monday as a final check of all required support systems for the mission, revealing no outstanding issues and clearing the PSLV rocket to enter a 51.5-hour countdown at 3:50 UTC on Tuesday to prepare the 45-meter tall rocket for liftoff. PSLV leverages the raw power of solid rocket motors in combination with the precision of liquid-fueled engines to accurately inject payloads into a variety of orbits. When flying in its XL configuration, PSLV uses a 20.3-meter long first stage holding 168 metric tons of solid propellant with six extended Solid Rocket Boosters clustered around it, each holding another 14 tons of propellant to deliver the kick needed to send the vehicle on its way with a maximum thrust of over 800 metric-ton-force. The 12.8-meter second stage is outfitted with a 799kN Vikas engine consuming 40,700kg of toxic hypergolic propellants while the third stage burns 6,700kg of solid fuel. In charge of finishing the boost to orbit is the fourth stage, powered by a pair of low-thrust engines using a hypergolic propellant combination. 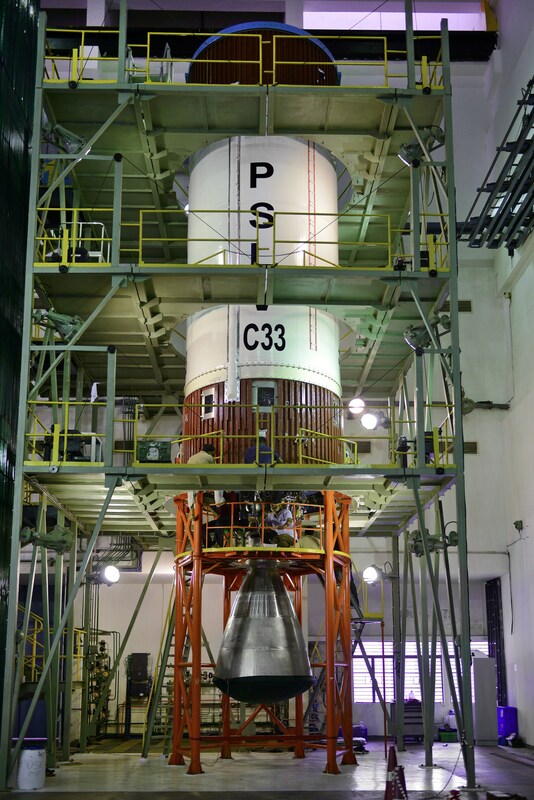 The two-day countdown operation for PSLV includes the methodical propellant loading operation to fill the second and fourth stages as well as the Roll Control Thrusters of the core stage. First up was Monomethylhydrazine loading on the upper stage and RCT followed by the loading of MON-3 oxidizer (Mixed Oxides of Nitrogen) – completed over the course of the day on Tuesday. On Wednesday, the second stage is being filled with its supply of toxic Unsymmetrical Dimethylhydrazine and Nitrogen Tetroxide. Pressing into the final phase of the countdown in the overnight hours, the rocket will be revealed atop its launch pad when the Mobile Service Tower is rolled back to a safe distance. The Launch Complex will be evacuated and a final round of checkouts will be started by the launch team to verify the communications and control systems on the PSLV rocket. Over the final minutes of the countdown, the launcher pressurizes its propellant tanks for flight, transitions to internal power and enables its flight control system in launch mode for PS1 ignition at the moment of T-0. At T+3 minutes and 19 seconds, the vehicle will have reached an altitude of 113 Kilometers, making it safe to separate the protective payload fairing since aerodynamic forces no longer present a danger to the satellite at that altitude. The second stage will conclude its burn and separate at T+4:22, reaching an altitude of 133Kilometers and a speed of 5.37km/s. Third stage ignition occurs one second after staging, starting a burn of 113 seconds during which the stage will deliver 24,900 Kilogram-force of thrust. After burnout of the third stage, PSLV will keep holding onto the stage for the nominal Stage 3-4 coast phase that is designed to allow the stack to gain altitude ahead of the fourth stage burn. It also allows the third stage to tail off any residual thrust to ensure a safe separation. The coast lasts from T+6:15 to T+11:03, a period during which the stack climbs from 140 to 192 Kilometers. Separation of the third stage is expected eleven minutes and three seconds into the flight followed ten seconds later by the ignition of the fourth stage’s L-2-5 engines on a burn of eight minutes and 29 seconds. IRNSS-1G is targeting an insertion orbit of 284 by 20,657 Kilometers at an inclination of 17.86 degrees. Cutoff of the fourth stage is expected at T+19 minutes and 42 seconds. IRNSS-1G will be separated from the PSLV at T+20 minutes and 19 seconds at an altitude of 498 Kilometers and an insertion speed of 9.6km/s. Very shortly after separation, the satellite will deploy its two power-generating solar arrays, establish communications with ground stations and stabilize its three-axis orientation. Over a period of days, the spacecraft will complete four burns of its Liquid Apogee Motor to insert itself into a Geostationary Orbit at 131.5°East.